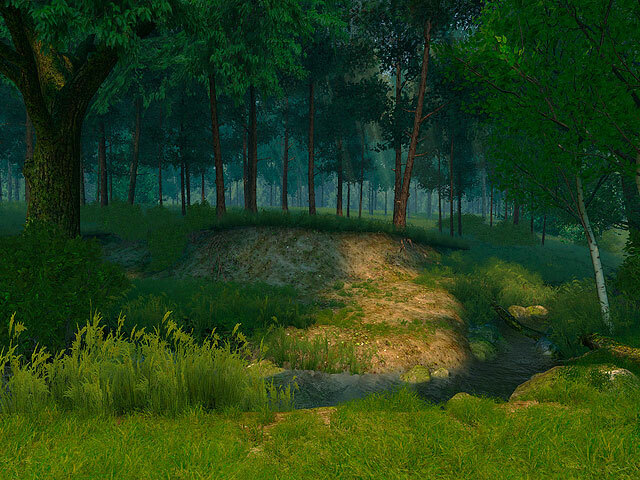 ﻿ Summer Forest 3D Screensaver – Give yourself a chance to watch exuberant green flora thriving around a placid stream. If you decide to carry out an inquiry of what season of the year you like most of all, the answers can be easily predicted: obviously, it is summer! This is the time when the nature is blossoming; when you have the opportunity to go on vacations and travel far away from the concrete and vitreous jungles of the big city, from the eternal noise, crowd and smog. However, the answers on the question of where is it better to spend your vacations will not be so simple: some people prefer to spend their money that was accumulated by hard work, on a trip to the southern regions; others suppose that the best vacations can be spent by going together to a countryside house; the rest will say that each summer they prefer to go camping. The Summer Forest screensaver will help you make a decision on how to spend the desired weekend: a picturesque margin of a pine wood with a thin stream will inevitably cause the specific associations in your mind of the times when the forest used to be our main refuge giving us food and shelter. Nowadays, we do not remember about it, but the genetic memory still exists. This marvelous background will definitely awake those nostalgic feelings inside you. Nevertheless, the nature of the moderate climate itself is unique and special. It is impossible to describe how pleasurable it is to find yourself in a morning forest when the canopies of the trees are hidden by the haze of the mist, whilst the sunrays tenderly and joyfully stream through the branches, thus, creating fantastic pictures of interchanging light and shadow on the grass. And all of these are breathing, sounding, swinging, creating the atmosphere of the true harmony and unity with the nature. 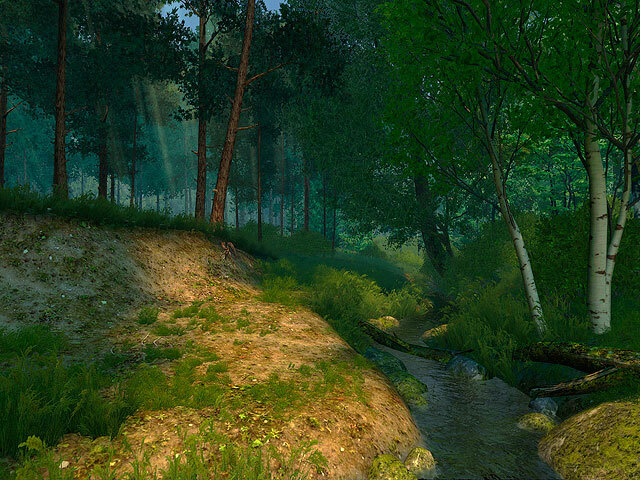 Looking at the popular Summer Forest 3D screensaver, it is impossible not to remember the years of your youth when the forest camping was so frequent and so desired, delivering you a lot of pleasure and new impressions! And if we are found under a constant time pressure today without the ability to get out in the nature as frequently as we would like to, but the use of this background will surely satisfy in one way or another our dreams about quiet and peaceful holiday.